Recently, National Heritage Museum staff began to review the extended loan objects that had accumulated under their roof. Many of these loans dated back to the early years of the Museum, before its own collection could support exhibitions and research projects. After three decades, the time seemed right to assess each loan for its relevance to the Museum’s mission and core priorities. In many cases, the objects on loan were determined to be one of a kind, offering fascinating possibilities for research, exhibits, and public programming. So, Museum staff began to ask their owners whether they might consider turning these loans into gifts for the permanent collection. One of the first generous lenders to accept this proposal was Occidental Lodge in Stockbridge, Massachusetts. Back in 1977, shortly after the Museum opened, Occidental Lodge placed a maul on loan to the Museum. As you can see in the picture, a maul is a heavy wooden-headed hammer, often used to drive wedges. This maul has an applied metal band that helps to tell the story of its significance, inscribed “Ancient Egyptian Maul Presented to Occidental Lodge by R.W. Brigadier General C.S. Wilson CB, CMG, DSO, District Grand Master of Egypt and Sudan.” In Freemasonry, the setting maul is a symbol of untimely death. Occidental Lodge was formed in Stockbridge, Massachusetts, in June 1870 when the Grand Lodge of Massachusetts granted the petition of twenty-three Masons from that town. These men set the purpose of the lodge, “to promote and diffuse the genuine principles of Freemasonry; for the convenience of our respective dwelling, and other good reasons.” The lodge grew steadily during the late 1800s and early 1900s, initiating members, pursuing charitable activities and meeting regularly. During these years, Occidental Lodge received a number of gifts, which they preserved as treasures. In addition to their officers' jewels, a set of Receiving Tools and several ceremonial gavels, in July 1928 the Lodge received the maul. The previous fall, at an October 5, 1927 Special Communication, the Lodge was visited by its presiding District Deputy, along with Brigadier General Charles S. Wilson, then-District Grand Master of Egypt and Sudan for the Grand Lodge of England. Unfortunately, lodge records do not reveal the occasion for Wilson’s visit to western Massachusetts, or what prompted him to make this gift. Instead, the gift of the maul is recorded as “a token of his esteem.” Wilson was the fifth District Grand Master after the District Grand Lodge of Egypt and Sudan formed in 1899. He succeeded his predecessor in 1926, after that man was assassinated on a Cairo street. Wilson served as District Grand Master until his death at sea in 1933. According to Wilson, this setting maul was found in the funeral temple of Pharoah Djoser (also known as Zoser), whose reign extended from about 2630 B.C. to 2610 B.C. The funeral temple is part of the Step Pyramid at Saqqara, Egypt. Built under the direction of Pharoah Djoser during his reign, by the architect Imhotep, the pyramid was the largest building of its time, standing 204 feet high with six stepped layers. The structure was intended to hold the Pharoah’s mummified body after his death. The Museum is pleased to add the maul to its collection – it becomes the oldest item in the collection. Maul, 1300-2000 B.C., Egypt. National Heritage Museum, gift of Occidental Lodge A.F. & A.M. in memory of those who served our country from Occidental Lodge, 2008.015. Photograph by David Bohl. In a previous post, we talked about the spread of Freemasonry throughout the world, and the means by which it got there, in most cases by colonialism. Today, we're taking a look at how one man in Afghanistan decided to become a Freemason in India in the early 20th century. Habibullah Khan (1872-1919) succeeded his father to the throne of Afghanistan in 19 01. In his coronation speech he announced his interest in pursuing policies of national unity, resistance from foreign aggression, and reform. His goal was to achieve an absolute Afghan central government. In 1904, Habibullah Khan founded the Habibya school for boys. Students were taught math, geography, calisthenics, as well as English and Urdu. He also established a military college where officers could get training. Between 1901 and 1904, Habibullah Khan bought equipment for local industry. He also continued to improve communication and trade. He built new roads and demonstrated that travel was important. After an official state visit to India in 1907, Habibullah Khan expanded his reforms. What happened during this visit to India? In 1907, at the request of the British government, the Amir of Afghanistan was invited to visit the Indian frontier. Lt. Col. A. Henry McMahon, Chief Commissioner of Baluchistan, accompanied the Amir and was in charge of the entire visit. After a few days in India, the Amir expressed interest in becoming a Freemason. McMahon was surprised because he did not understand the Amir's motives and didn't think that the Amir wanted to bring Freemasonry to Afghanistan. McMahon finally realized that the Amir was very earnest about his request to be initiated into Freemasonry. Habibullah told McMahon that he had met good men who were Masons and that he knew Freemasonry to be a good thing. In the name of diplomacy, McMahon received permission for the Amir's initiation from Lord Kitchener, District Grand Master of the Punjab and Grand Master, the Duke of Connaught. 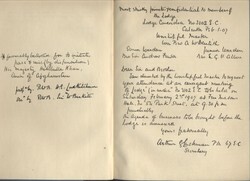 In the facsimile letter shown here (from a book published in 1936), Lord Kitchener votes to accept the Amir into the lodge. His Majesty Habibullah Khan, Amir of Afghanistan, was initiated into Freemasonry in Calcutta, India. This occurred at Lodge Concordia, No. 3102 which had a small exclusive membership, restricted to British civil and military officers of high standing. The first, second, and third degrees were all conferred upon the Amir. The ceremony was conducted in English, with Henry McMahon interpreting the entire Masonic ceremony into Persian for the Amir. He took his Masonic oaths on a Koran that is now at the Library of the Grand Lodge of England. Because knowledge of his Masonic affiliation could be used against him by his enemies in Afghanistan, the Amir's membership had to be kept a secret from his staff, soldiers, entire entourage, and the public. Although secrecy about his Masonic membership was kept in India, when the Amir returned to Afghanistan rumors about the Amir being a Freemason started to surface. The leading mullahs seized on this opportunity to make trouble for the Amir. Finally, the Amir announced publicly that he was a Freemason, that he was proud of being a Freemason, and that he had become one to benefit Afghanistan. Habibullah Khan was impressed by Western (British) techonology he had seen in India, and when he returned to Afghanistan he made further attempts to Westernize the country. For better or worse, he saw Westernization as a step toward modernization for his country. It seems that, to Habibullah, becoming a Freemason may have been a personal manifestation toward Westernization as well. McMahon, Henry A. An Account of the Entry of H. M. Habibullah Khan Amir of Afghanistan into Freemasonry. London: Favil Press, Ltd., 1936. If you look today at where Freemasonry exists in the world, you might initially be surprised. The National Grand Lodge of Togo? The Grand Lodge of India? The Grand Lodge of the Philippines? The Grand Lodge of New Zealand? How did Freemasonry spread to so many corners of the world? Most of Freemasonry's travels through the world not only followed the same routes as colonialism, but, in fact, spread throughout the world via colonialism. This might seem surprising at first, until you realize that two of the major colonial powers of the 18th and 19th centuries - England and France - were also places where Freemasonry originated and flourished. And where colonial powers traveled, Freemasonry traveled with it. Wonder how Freemasonry ended up in the United States? That's right - colonialism. Freemasonry was established in what is now the United States in the 1730s - in what were then the British colonies. Some excellent scholarship on Freemasonry has been published recently, including a book that came out just last year on the topic of Freemasonry and British colonialism - Jessica L. Harland-Jacobs's Builders of Empire: Freemasons and British Imperialism, 1717-1927 [Call number: 17.942 .H37 2007]. 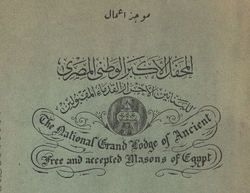 Pictured above is a detail from the cover of the Proceedings of the National Grand Lodge of Free and Accepted Masons of Egypt, 1922-1923, published in Cairo in 1923 [Call number: 17.962 .E32 1923]. The book is printed both in English and in Arabic. Freemasonry in Egypt began in the early 19th century with the first warrants for lodges coming from France and Germany. Later, in the 1860s, a number of other lodges were chartered by England, Scotland, and the Grand Orient of Italy. Eventually the National Grand Lodge of Egypt became the predominant Masonic body in Egypt. Its lodges conducted their ceremonies and business in Arabic, Greek, French, Italian, Hebrew, and German. When Gamal Abdel Nasser came to power in 1954, Freemasonry in Egypt started being suppressed and was eventually abolished by President Nasser in 1964. Although Nasser died in 1970, Freemasonry is still essentially non-existent in Egypt today, something that is true in many countries in the Middle East. As with many countries where Freemasonry is outlawed (or effectively banned through intimidation), there are lodges that practice in exile in other countries. Egypt is no exception to this - one example is Lord Kitchener Lodge No. 3402, a lodge that was founded in Cairo in 1909, but which is now located in Cyprus. If you'd like to learn more about Freemasonry throughout the world, a great place to start is the two-volume set listed below. Volume 1 covers the Americas and volume 2 covers Africa, Europe, Asia, and Oceania. Also listed below is the book by Harland-Jacobs mentioned above. Kent Henderson and Tony Pope. Freemasonry Universal: A New Guide to the Masonic World. 2 volumes. Williamstown, Australia: Global Masonic Publications, 1998 & 2000. Harland-Jacobs, Jessica L. Builders of Empire: Freemasons and British Imperialism, 1717-1927. Chapel Hill: University of North Carolina Press, 2007.